The ITE Alaska Section Pedestrian and Bicycle Committee has recently been formed. The purpose of this committee is to facilitate discussion among engineering and planning professionals on topics related to pedestrian and bicycle design and analysis with specific guidance for Alaskan communities. The committee chair is Chris Grgich. Section meetings are held on the first Tuesday of each month at the Alaska Aviation Museum (Student members can attend for free). Upcoming topics include expert witness testimony, LiDAR/GIS applications, and the construction of Glen Alps Road. Section meetings will be held April 19 and May 18 (See www.cowyite.org). The 52nd Annual Meeting of the ITE Intermountain Section will be May 10-12, 2012 at the Snow King Resort in Jackson, Wyoming. In addition to the regular technical program, the meeting will include a traffic signal workshop from Northwestern University’s Center for Public Safety (May 7-9) and a golf tournament organized by the Montana State University ITE Student Chapter. To register online or to access interactive PDFs of the registration forms, please visit our registration website at www.regonline.com/iteintermountainmeeting. The NorCal Section recently completed a significant re-branding effort and rolled out our new website (www.norcalite.org) and logo in January. As part of the development of our new website, we also began using the Eventbrite web service for Section event notifications and attendance tracking. Section meetings will be held April 19 and May 17 (Check out www.norcalite.org for more information). The Annual Student Endowment Fund Golf Tournament will be held on April 27th at centrally located Haggin Oaks Golf Club in Sacramento. Members of the Section Board participated in the Sacramento State Student Chapter elections in the Fall. In addition, we recently solicited applications from our Section colleges and universities for an all expenses paid trip to this year’s District Annual Meeting in Santa Barbara. Applications have been received and the Board is currently in the process of evaluating our respondents. Richard Corbett was honored for his years of service in the local transportation engineering and planning arena. Jorge Riveros was presented with a Certificate of Appreciation for his recent turn as SAITE president. The SAITE Scholarship was awarded to UAITE Student Chapter President Monica Soto. 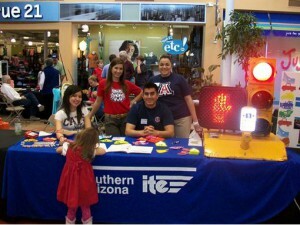 SAITE participated in the 2012 Engineers Week Mall Day event to inform the public about the engineering profession. SAITE was assisted by the UAITE (University of Arizona Student Chapter of ITE), and financial assistance was provided to the student chapter for their participation in this event. Section meetings will be held May 4 (Check out www.sandiegoite.org for more information). Mr. Joy Bhattacharya was awarded the 2011 Transportation Professional of the Year, and the 2011 Transportation Project of the Year was awarded to “Temporary Transbay Terminal”. The owner team includes Edmond Sum, TJPA Engineering Manager, and Phil Sandri, Project Manager (PMPC Program Team). The SFBayITE’s 2011 Golf Tournament raised over $600. The proceeds will go to the SF Bay ITE Section Scholarship Fund. Section meetings are held monthly (Check out www.sfbayite.org for more information). Washington Section ITE Student Activities committee co-chairs are currently working with the University of Washington Student Chapter to provide oversight and mentoring for the recently awarded data collection project. The Washington Section ITE Student Activities committee has been working with the City of Seattle Traffic Management Divisions to develop an interesting and challenging project for our Annual Student Night competition, which will be held in May. The Washington Section will soon be announcing that application materials will be available for the undergraduate and graduate scholarships. The scholarships are awarded to students interested in pursuing a career in transportation engineering or planning. The undergraduate scholarship amount is $1500.00 and the graduate scholarship is $2000.00. Section meetings are held monthly (Check out http://westernite.org/Sections/washington/ for more information).